Instance of SCP-1501, documented in 19██. Special Containment Procedures: All instances of SCP-1501 are to be disassembled and held in standard containment chambers, located within Site-77's Euclid SCP wing. Any media related to the SCP-1501 phenomenon found outside containment is to be stored in Site-77's non-anomalous media storage unit. Any media relating to the "Manna Charitable Foundation" is to be investigated by Foundation agents. Description: SCP-1501 is a set of humanoid automatons, constructed of copper, iron, plastic, and animal hair. The words "Manna Charitable Foundation Official Charity Delegate" have been embossed into the back of every SCP-1501 instance. Each SCP-1501 instance possesses some method of collecting funds, such as a bucket, cauldron, box, or satchel. 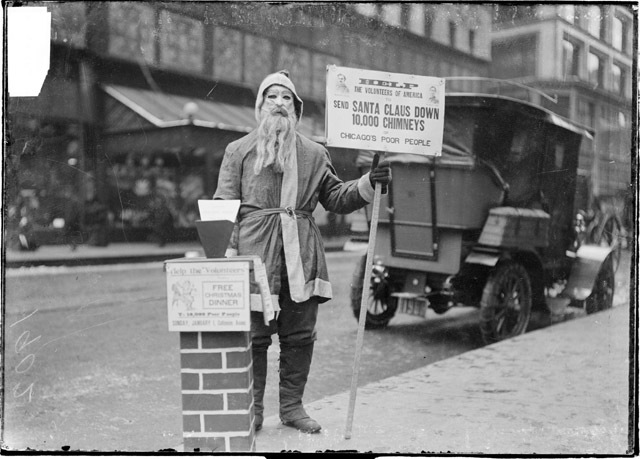 When not in containment, instances of SCP-1501 will move to areas such as street corners, office buildings, traffic lights, and other locations where charity collectors would be common. Once within these areas, they will begin collecting money for a variety of charities. Observed collections have been varied, with collections for endangered species of birds, poverty, AIDS, and under-performing Foundation facilities. All funds collected by SCP-1501 instances will be placed within their collection box, after which the instance will transfer it into the possession of the charity the SCP-1501 instance was collecting for. Methods of transportation include the US Postal system, transporting it by hand to an office representing the charity, or sending each bill individually with an avian organism. When a humanoid subject repeatedly donates to an individual instance of SCP-1501 multiple times, it will begin following the subject continuously, observing any financial transactions they perform. The instance will follow the subject to their home, place of business, and any other location the subject may travel to. After 2-3 weeks of this, the SCP-1501 instance will begin to collect for charities which they believe the subject would have an inclination to donate to, based on their activity during this period. Eventually, instances of SCP-1501 will find a wealthy subject, with a propensity to donate to charitable organizations. The instances will then focus all their attentions on this person, sending letters advertising various charitable organizations to their homes in order to convince them to donate more of their money. This will continue indefinitely, until the SCP-1501 instances are physically unable to solicit the subject. As the solicitation of this individual increases in frequency, instances of SCP-1501 may disguise themselves as the subject's spouse, or alter their mail to persuade the subject to donate. Disguises may include a wax prosthesis and costuming themselves in the clothes of the person they are imitating. If the subject discovers SCP-1501's anomalous properties, they may attempt to use alternate disguises, or cease directly visiting the subject in favor of sending letters about the charity. In the event that authority figures are contacted about the instance, they will attempt to flee, and become inert if captured. Foreword: This interview was taken shortly after initial containment. Dr. Boyd: When did you first notice something was wrong? ██ ██████: She turned to look at me… but it wasn't her. Her face was too angled, and it was looking at me with glass eyes. God, I just stared at it. Then it (subject inhales deeply) started talking. Dr. Boyd: What did it say? ██ ██████: The mouth opened… god, must have been more than half a foot. The jaw just dropped, and stripped off. Wasn't skin, but whatever it had on it. It asked me if I… had considered the plight of the homeless. Dr. Boyd: Is this when you attacked it? SCP-1501 was initially discovered in █████, Chicago, after several instances of SCP-1501 had repeatedly raised money for several charities designed around the giving habits of wealthy resident ██ ██████. After ██ ██████ reported SCP-1501 phenomenon to local authorities, Foundation agents investigated and were able to document SCP-1501's effect. Foundation operatives were able to contain them on 9/19/19██, and they were classified as Euclid. Since then, approximately 56 additional instances of SCP-1501 have been contained. Addendum 1501-A: Document created by SCP-1501, to advertise the "Help The Homeless: What If That Was YOU!!!??? ", found within the former home of ██ ██████. Document had been created by an SCP-1501 instance, and appeared similar to other documents created by it, with minor changes made to reference the homeless instead of starving children. IF ONLY there was a KIND, BRAVE, HANDSOME STALLION who could RESCUE the POOR, DESPERATE PEOPLE WHO need THEIR HELP. Addendum 1501-B: Document recovered from a Manna Charitable Foundation facility in █████ ████, GA.
We must be doing more about those bum bots. I thought they were going to be a great way to get the word out, but they're just attacking people for money. Like parasites! A lot of people have a hard time trusting us already, and this is just gonna add more fuel to the fire. Peter was asking around for who donated them, and we think he had… ulterior motives. They're mostly attacking folks in the same business as them. I told you Wehrner, you just can't trust these people! They say their device does one thing, and it does, but there's always a dang catch. Hopefully, this crane we got to clean up will be the last time we have to deal with them. Addendum 1501-C: As is standard procedure, the Object Classification for SCP-1501 was reviewed following an instance assaulting a Site Director during a containment breach. This review has resulted in a continuation of the Euclid object class, with disassembly of all instances becoming a part of its containment. Addendum 1501-D: Leaked data from Manna Charitable Foundation suggests that several SCP-1501 instances will be relocated to a future MCF facility at Ontario, Canada. If the existence of the facility is verified, SCP-1501 instances are to be intercepted.